A simple exercise to get you playing with ideas and finding unexpected possibilities. “Play generates novel ways of dealing with the environment”.2 However, as Bateson and Martin continue, sometimes these novel ideas lead nowhere and sometimes they become the most insightful, useful, and transformative ideas you have ever had. To find those good ones you’ve got to start playing, you may have to play a lot, and sometimes you will have to play with ideas you didn’t even know could be played with. Yet, starting to play can be a daunting task, continuing to play can be tiresome, and identifying what to play with can be troublesome. This task offers an easy and succinct way to begin conceptually playing with even the most familiar situations as well as a way to keep playing even when energy is low because, if nothing else, it can be used to amusing effect on pretty much anything. Think of a lesson you’re about to teach, a meeting you’re about to run, a conference you’re organising, a module you’re convening, or anything similar you want to try playing with. Create two columns. 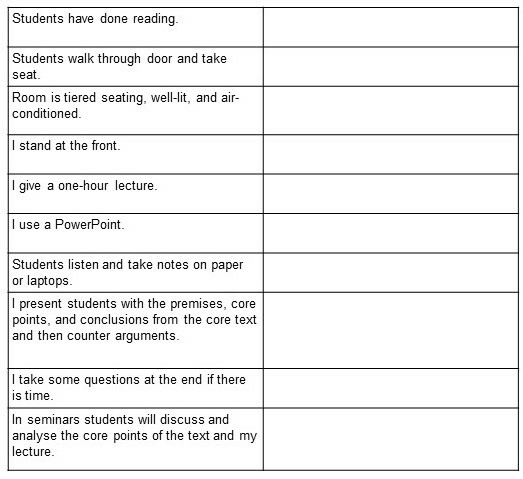 In the first column, break down the lesson or meeting into its constituent parts. Be as fine-grained in your details as you like but try to include things like what the room looks like and how you expect to lead the session. The more you have written down, the more you have to play with! Now, in the second column write down what each thing would look like ‘flipped’. Try it: Before going on, fill out the above table and see what you get. Tip: As a philosopher I sometimes struggle with exercises like this as I start to become concerned with getting the flip ‘right’. Don’t get caught up on whether what you’re saying is the ‘true’ opposite of the first idea. Go with your intuition and write the response down. Some of the resulting ideas will seem completely untenable and you will automatically dismiss them. However, try to dedicate some time to thinking each one through. If it helps, treat every idea as if it were a serious suggestion presented by an informed colleague for discussion. How would you approach it then? Why might someone suggest this as a good idea? What might that person’s intended outcomes and goals be for the session? List them underneath the right-hand column. Are they good ones? Does the new idea have any benefits compared to how you’ve already planned things? Does the new idea trigger any more thoughts? Try it: Take a look at the above table, or your own version, and apply the questions. Good teaching and planning practice often dictates that you should look to your learning objectives or desired outcomes in order to design your session. In most cases this is absolutely right. Doing so helps you stay on track, structure a session effectively, motivate participants with articulable goals, and so on. Do any of these new ideas allow participants to reach the learning objectives? Could I adapt the ideas to achieve the proposed outcomes? Does using the new ideas add something else to the session? If you listed hypothetical objectives under the right hand column as well then the comparison may be interesting to reflect on now. Some of the ideas will remain just as crazy as they seemed. Enjoy those for what they are. Enjoy even more though the unexpected thoughts and activities they trigger.